Just before Christmas, Printworks released the first edition of their spring event listings. It was at this point that we learnt that Eats Everything would be bringing the infamous Edible Beats to the capital, for a very special 100th show. 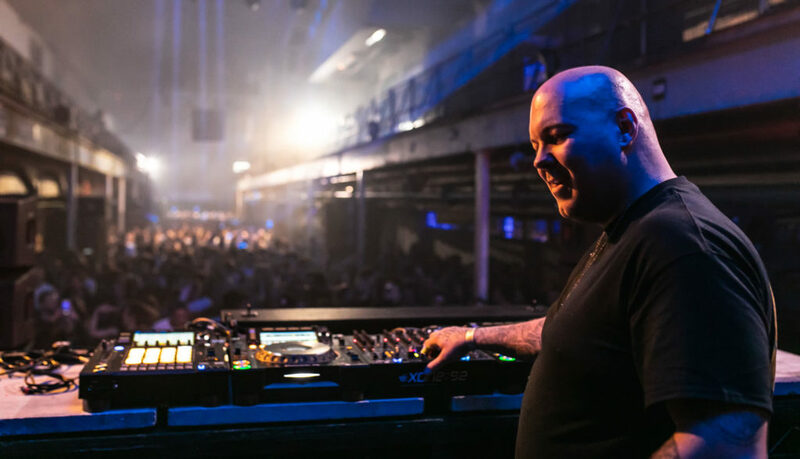 With a carefully selected line-up featuring the bossman himself alongside Alan Fitzpatrick, Andres Campo, Cinthie, Green Velvet, Nastia, Melé, Ben Sterling, Maze & Masters, Lord Leopard, Ellie Stokes, and Zenzero. to say that we were excited is a definite understatement. Personally, I hadn’t been to Printworks since November, and truthfully I had started to miss it quite a lot over the Christmas period. It has definitely become one of my preferred places to head out to in London. I’m not sure what it is about the place. Maybe it’s the layout? Maybe it’s the fact that there never seems to be a big queue at the entrance? Maybe it’s the fact that it honestly blows my mind every time I step inside the place? Maybe its all of those things? Ha – I’ll let you decide. Regardless, I was very happy to be returning and extremely eager to see how the day and night would unravel. We arrived to Printworks at about 4pm and within a matter of minutes we were inside and ready throw ourselves into everything that Edible Beats had to offer. After casting our eyes over the line-ups dotted around the venue, and grabbing some drinks from the bar, we headed up the steps and out into the Press Halls where we were met by the thumping sounds of Andres Campo. Arguably one of Spain’s most successful DJ’s currently, it was a pleasure to finally hear him live doing what he does best. The hour and half that followed was truly something special to witness. His set rose and fell throughout, bringing with it a selection of foot stomping tech, blended in with some beautiful, progressive, chord-driven techno. 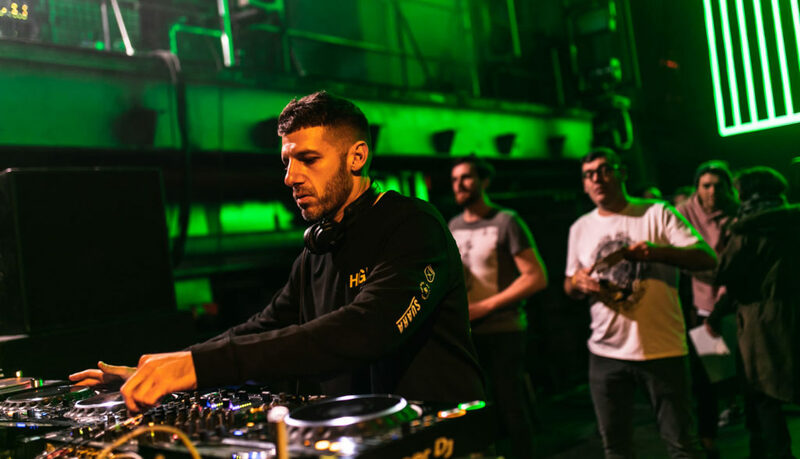 By witnessing Andres Campo at work behind the decks you can really start to understand how this guy has come so far, and how he has achieved as much musical recognition as he has. A bit of a musical wizard in my opinion. A personal highlight for me was when Andres dropped the dub version of ‘Time to Breath’ by Ignacio Arfeli. What a tune! Next on the schedule was Anastasia Topolskaia, the Ukrainian DJ better known as Nastia. Now for those of you who haven’t had an opportunity to listen to one of Nastia’s sets before, I would describe her sound to be something that resembles the act of opening up Pandora’s Box. You never know what you are going to get, but I can guarantee that it will be an array of strange, weird, and wonderful sounds, that will truly captivate you. 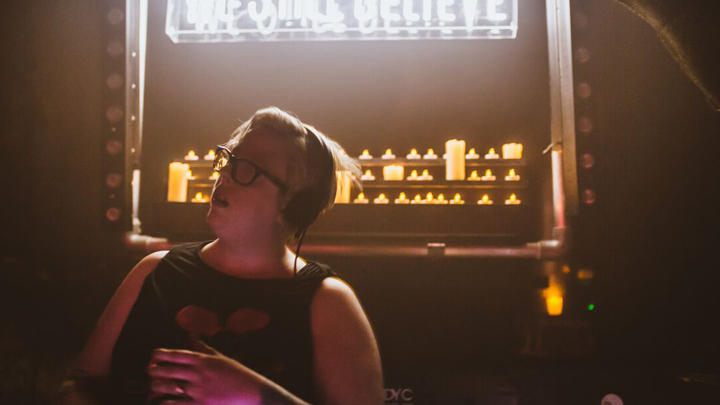 For Edible Beats 100, Nastia decided to drive a particularly heavy techno set into the foundations of Printworks. The tempo of the music shot up considerably, and you could see the crowd were absolutely loving every second of it. I would say the pinnacle of Nastia’s set was when she played out ‘Gundam’ by Raffaele Attanasio. If you haven’t heard this particular track then go and give it a listen immediately. It’s a crowd pleaser every time. Printworks completely erupted, and as the lighting production went absolutely crazy, you could see Nastia smiling away behind the decks. 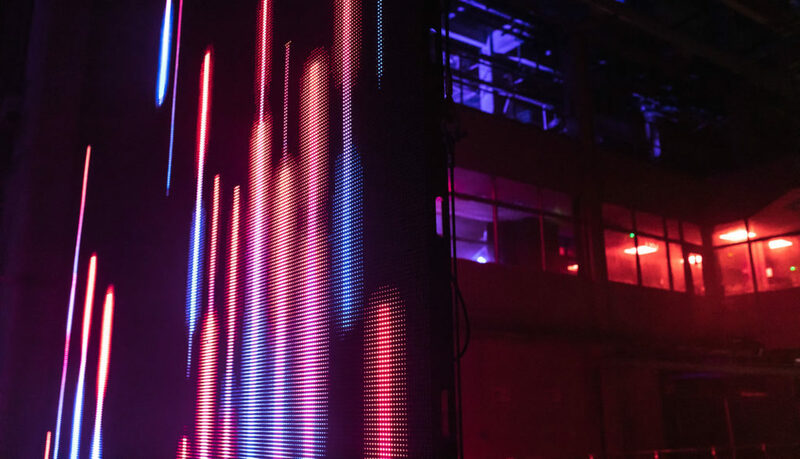 As 7.30pm arrived, the lights dipped down low casting a red tint over Printworks with the Edible Beats sign glowing in orange above the crowd. It was time for Eats Everything B2B with Green Velvet. A ringing could be heard building up through the sound system and it was at this point that we all heard a familiar sound. The muffled voice of Green Velvet speaking into his headphones echoed round the halls welcoming all those to their night of fun. As Green Velvet finished his words of wisdom, the sound of laughing erupted round the space, and we were immediately flung into an explosion of strobes as whole place went off! What I love about Eats Everything and Green Velvet, is that their musical tastes compliment each other so well. Granted, Eats Everything will play pretty much anything under the sun if you give him the opportunity, but whenever he gets together with Green Velvet, there always seems to be a stomping techno vibe with some extremely heavy acid influences. 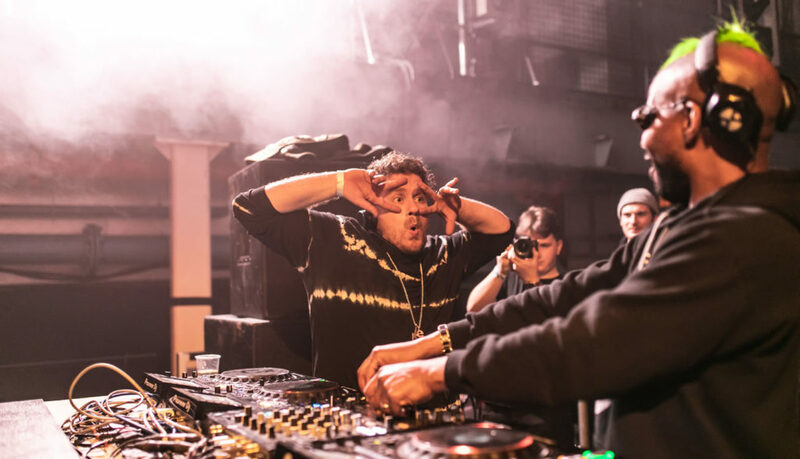 Another thing that’s also worth mentioning about Eats Everything, is that he also seems to love taking a particular track that he enjoys, and ‘Reebeefing’ it. What I mean by that is he will take music that he likes and then bulk it out with his particular sound, to the point where it becomes a pounding track that will rattle even the biggest of sound systems. One of the tracks that got the biggest reaction was his ‘Reebeef’ of ‘U’ by Scot Project, with the vocal from St Germain’s ‘Rose Rouge’ laid perfectly over the top. 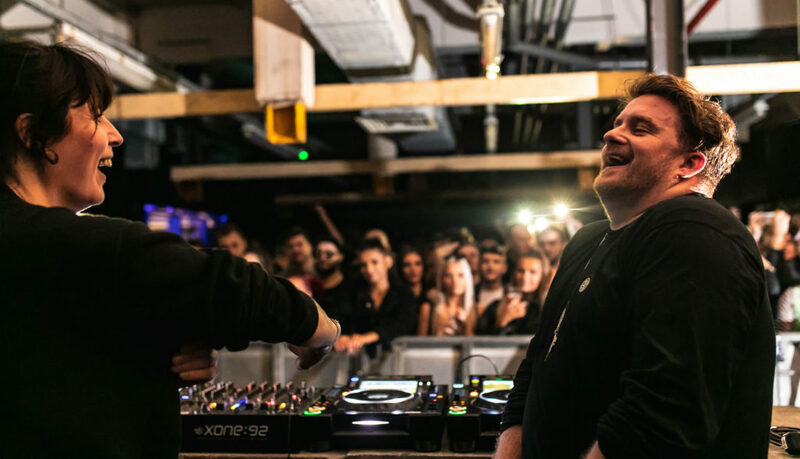 Throughout the set you could see Eats Everything and Green Velvet laughing and joking with each other, as they dropped track after track flawlessly to the entranced crowd that they had laid out in front of them. It becomes obvious when a pair of producers enjoy performing alongside each other and I would say that these two as a duo, tick all the right boxes. They truly showed Printworks how to have a good time, and what a performance and set to celebrate the 100th show. The final act of the night was Alan Fitzpatrick. I have always loved Alan’s particular style ever since I first heard one of his records. 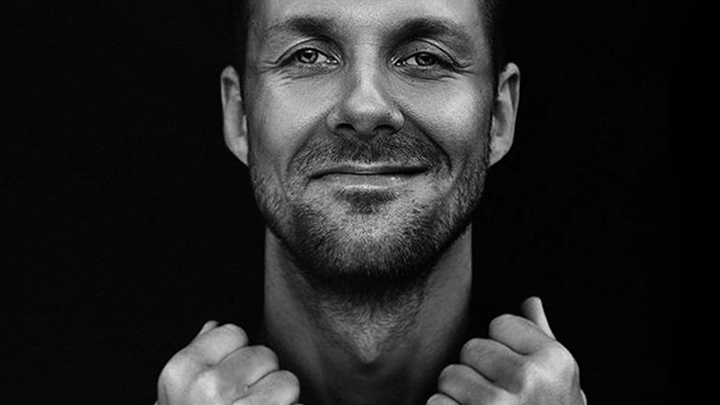 His techno always seems to have some quirky groovy melody, whilst at the same time maintaining that dark and muffled underground vibe that so many producers attempt to replicate. As well as playing some Fitzpatrick original classics such as ‘We Do What We Want’, he also stayed in line with how the rest of the evening had played out, and continued to pound out some extremely cheeky acid. My favourite track of his set has got to be ‘303 003’ by Planet Rhythm. It gives off that 90’s warehouse vibe, and I think that’s what we are all looking for to be honest. Wouldn’t you agree? As the night drew to a close it was clear that Edible Beats 100 had absolutely nailed the evening, and had left a happy memory with everyone that night. Printworks was as usual a pleasure to attend and I am extremely excited to get back there this month. A big thank you to all who helped organise the night, and a shout to Eats Everything for continuing to provide us with the parties that he does. Edible Beats…..until next time!